Dogs with tracheal collapse should be walked using a harness, not a collar, to reduce pressure on the windpipe. Tracheal collapse occurs when the cartilage that forms the windpipe weakens, allowing the tracheal membrane to touch the tracheal lining. This contact creates a tickling sensation, causing your dog to cough--and potentially to panic. 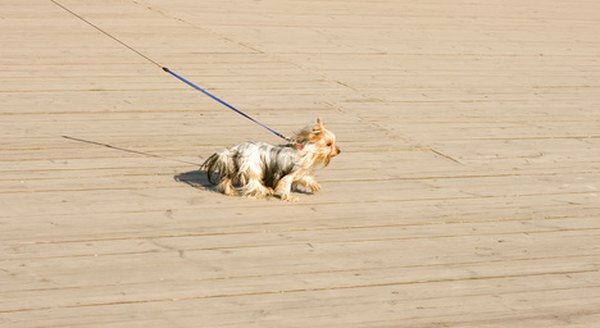 It is a common condition in small dogs and in middle-aged or older dogs. According to the Mar Vista Veterinary Animal Hospital website, the dogs that experience tracheal collapse are “almost always [toy breeds], with poodles, Yorkshire terriers and Pomeranians most commonly affected." Although it may have a genetic component, some factors that may cause tracheal collapse include age, obesity, respiratory infection, irritants in the air and an enlarged heart. In addition, tracheal collapse can occur when a tube has been placed in the dog’s throat, as for anesthesia. A simple treatment for mild tracheal collapse is to remove all respiratory irritants from your dog’s environment. Wood smoke or tobacco smoke of all kinds should be eliminated. Some irritants can be brought into your dog’s environment on your clothing and hair, such as pollen and dust. Obesity can cause your dog’s body to work too hard to perform simple tasks. Reducing his weight will help him breathe more easily; however, strenuous exercise may cause bouts of coughing. If your dog has tracheal collapse, keeping him at ideal body weight or even slightly underweight can be beneficial to his health. Mild tracheal collapse may be managed with cough suppressants or medicines to reduce occurrence of spasms. They may also be treated with drugs that widen airways. However, some of these drugs are controversial, as they widen related airways and not the trachea itself. Antibiotics may also be used if the tracheal collapse is caused by or related to an infection. Finally, some dogs may need to be sedated to reduce their coughing-related anxiety. According to the American College of Veterinary Surgeons, up to 70 percent of all dogs with tracheal collapse can be treated without surgery. Surgery can be performed either within the neck or within the chest. When surgery is performed within the chest, treatment usually consists of placing a spring-like device inside the trachea. This device, called a stent, holds the trachea open. Surgery performed in the neck usually consists of replacing the failing cartilage with C-shaped plastic rings. Even when stents are placed, many dogs have the ring-replacement surgery in the neck.